Barbara Vieyra, 22, also known as Barbie passed away September 18, 2010 in Afghanistan fighting for what she believed in. She was born July 2, 1988 in Phoenix, Arizona to Raul & Elizabeth Vieyra. She attended Smith Junior High and graduated from Skyline High School in 2006. She was full of life and always so happy, and out going. She was very caring and had a close relationship with her brother and sister; they use to go inside a blanket and fill it with pillows and one of the three would be in there and the other two would push them down the stairs. She is survived by her daughter Evelyn Vieyra, her parents Raul & Elizabeth Vieyra, two immigrants from Mexico, her sister and brother Guadalupe & Roberto Vieyra, and grandparents Roberto & Leovigilda Vieyra. She was preceded in death by her nephew Carlos Cardenas who passed away September 14, 2008. There will be a visitation Friday October 1, 2010 from 6 p.m. to 8 p.m. at Bunker’s Garden Chapel, 33 North Centennial Way, Mesa, Arizona 85201 (480) 696-6883. Funeral services are Saturday, October 2, 2010 at 11 AM at the LDS Lehi Ward building, 830 East Lehi Road, Mesa, AZ 85203. 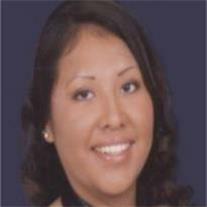 Any donations can be made at Wells Fargo Bank for Evelyn Vieyra. Thank you to everyone that has donated and helped our family though this difficult process and to the army. SOMEONE ONCE TOLD ME… LOVE POEM “Like the stars in the sky, I am calling to you. From the heavens above, I am looking for you. In the depths of my soul, I will live and breathe for you. Sadness dwells inside you; You have nothing to fear, for I am next to you. I can feel your sadness; Let me be sad for you, so you will feel love once again. Worry not about life, let me worry for you. You should always love life, for it is a part of you. I’ll be there when you fall, to catch you and say I Love You … Happy, caring, and loving.